With Father's Day just round the corner, I decided to give my dad this handmade clean, yet rugged looking card. I don't think cards can be totally rugged looking, as then it would just look plain messy. 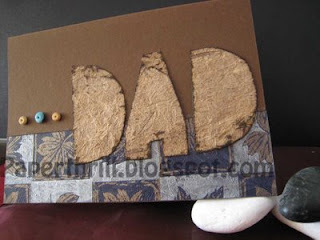 In Malaysia, Father's Day (or any other days like Valentine's or Mother's Day) is slightly over commercialized, and I feel that giving a handmade card is much more personal, and definitely will leave a warm fuzzy feeling in my dad's heart! I used a nature inspired textured paper to cut out the 'Dad' word and I distressed it a little, and the effect was splendid! I then used some beads as accent to liven up the card since it looked a bit too dull being just brown. 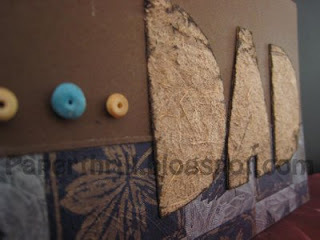 I'm beginning to love the colour combination of tiffany blue and brown. They complement each other so well! There'll be more cards with this colour combo coming your way soon!